A one day trek to explore the countryside around Chiang Mai. Meet the Karen hilltribe, ride on elephants and glide down the river on a bamboo raft. Itinerary : Pick up from your hotel at 8.30am. Drive approx. 45 mins to the south-west of Chiang Mai. During the day, walk for approx. 1 hr., ride on elephants for approx. 45 mins, and raft down the river for approx. 1 hr. 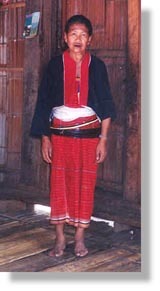 You will be able to meet the Karen hilltribe on this trek and see some of their villages. A packed lunch is taken to eat during the day. Itinerary : Pick up from your hotel at 8.30am. Drive approx. 1 hr.to the north of Chiang Mai. 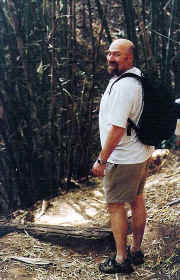 Arrive at the elephant camp and ride the elephants for approx. 1 hr., then travel down the river by bamboo rafts for approx. 1 hr. Drive on for another hour to a Karen village. Have a packed lunch at the Karen village. 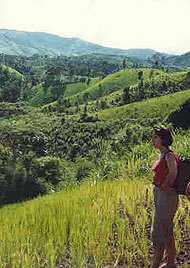 Then explore around the Karen village and walk for half an hour to a Lisu village. Walk another 15 mins. to an Akha village and from there continue by vehicle to a Palong village. An opportunity to visit with the different tribes and hear about their lifestyle and culture. Then drive back to Chiang Mai. If you are fairly fit but are short of time, then try this one day trek, which takes you for a long one day hike. As well as walking, you will ride on the elephants and go bamboo rafting too. 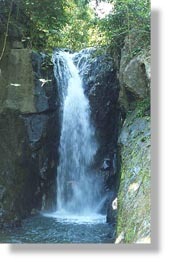 There are also some refreshing waterfalls in which you can swim; so bring your bathing suit along! The perfect chance to cool off, if the weather is hot. Itinerary : Pick up from your hotel at 8am. Drive 45 mins. to the south-west of Chiang Mai. Arrive at the elephant camp and ride on the elephants for approx. 1 hr. Drive on to a Karen village, where we start a 2 hr. hike through the forest. We pass a number of waterfalls on the way; you can cool off with a refreshing swim. We end up at a Karen village, where there's time to rest and explore. Lunch is had along the way or at the village. After exploring the village walk for 1 hr. to the pick up point, and then drive to the start of the rafting trip. Travel down the river on bamboo rafts for approx. 1 hr. Then drive back to Chiang Mai. A one day trek that takes you on a hike through the hilltribe villages to see the Lahu, Karen and Palong villages. After the 2-3hr easy hike we visit the Chiang Dao Caves, an ancient complex of temple caves. This is a good trek for those that like to take an easy hike without the elephant riding or rafting. Itinerary : Pick up from your hotel at 8.30am. Drive approx. 1 hr.to the north of Chiang Mai. We start hiking from the Lahu village. The total hiking time is approx. 2 1/2hrs and is fairly easy with no steep hills. We take a picnic lunch to have along the way. Along the way we stop to explore the villages of the Karen and Palong hilltribes and enjoy the scenery of rural Northern Thailand. At the end of our hike we are picked up by our vehicle and drive for approx. 30mins to the Chiang Dao Caves. We explore inside the caves and see the many Buddha images placed there by worshippers throughout the previous centuries. Then drive back to Chiang Mai, approx. 1 ½hrs. A one day trek to really stretch your legs. A challenging hike to see the scenery of Chiang Dao. This concentrates on only hiking and is for those that really enjoy walking. This is a good trip for those that want to hike without extra activities. Elephant riding and rafting can easily be done on another day. On this day you will see the mountains, the hilltribes and really stretch those legs! Itinerary : Pick up from your hotel at 8.00am. Drive approx. 1 1/2 hr.to the north of Chiang Mai. We start hiking from the Lisu village. The total hiking time for the day, is approx. 4hrs and includes some steep hills as well as flatter terrain . We have lunch in a village along the way. Along the way we stop to explore the villages of the Karen and Palong hilltribes and enjoy the scenery of rural Northern Thailand. During the day you will pass through forested areas and farmland. 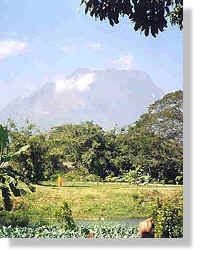 On clear days there are good views including those of Doi Chiang Dao, one of Thailand's tallest mountains. At the end of our hike we are picked up by our vehicle and drive for approx. 1 1/2hrs back to Chiang Mai. Another trek for those fairly fit but short of time. 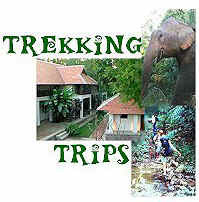 It has all the features of elephant riding, rafting & hiking. Enjoy the ambling of the elephants along the small trails and the thrill of a bamboo rafting trip along the Ping River. The hiking is a good one day route for those that are fit and used to walking. Itinerary : Pick up from your hotel at 8.00am. Drive north of Chiang Mai for approx 1 1/2 hrs into the countryside. Drive off the main road and disembark to start hiking. Hike through the hills approx. 2 1/2 hrs to the elephant camp. The hiking is moderate level but you should be fairly fit. We get to see a variety of local scenery and villages during the day, including Karen and Palong tribes. 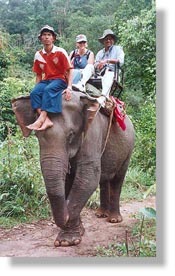 Ride elephants along a small path for approx 1 hr to join our transport. Drive a short distance to the rafting start point and raft down the river on bamboo rafts for approx 1-1 1/2 hrs. Drive approx 1hr back to Chiang Mai. 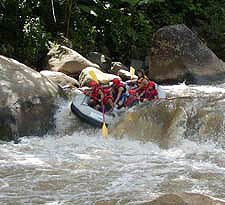 An adventure trek out to the Mae Taeng area, including whitewater rafting. Itinerary : Pick up from your hotel at 8.00am. Drive north of Chiang Mai for approx 1 1/2 hrs into the countryside. Drive off the main road and stop at the elephant camp. Elephant riding for approx. 1hr. Then take a trip across the river using a system of pulleys that transport you across the river where there is no bridge. Hike to a waterfall for approx. 1hr and back again for 1 hr. (total of 2hrs), then to the start of the whitewater rafting point. Exciting whitewater rafting for approx. 45mins. Then drive back to Chiang Mai stopping at an Akha hilltribe village on the way back. Chiang Mai hilltribe trekking and tours. 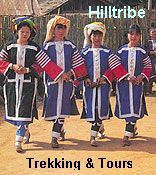 A range of treks and tours that include visits to hilltribe villages. Specific information on each tribe found in Northern Thailand.